Its that time of year again, the leaves are turning, the smell of spices are in the air, chili recipes are being dusted off, and people in wetsuits are roaming the stores looking for pumpkins! Join us for the festivities on October 27th from noon - 3pm at Clear Spring Scuba park. 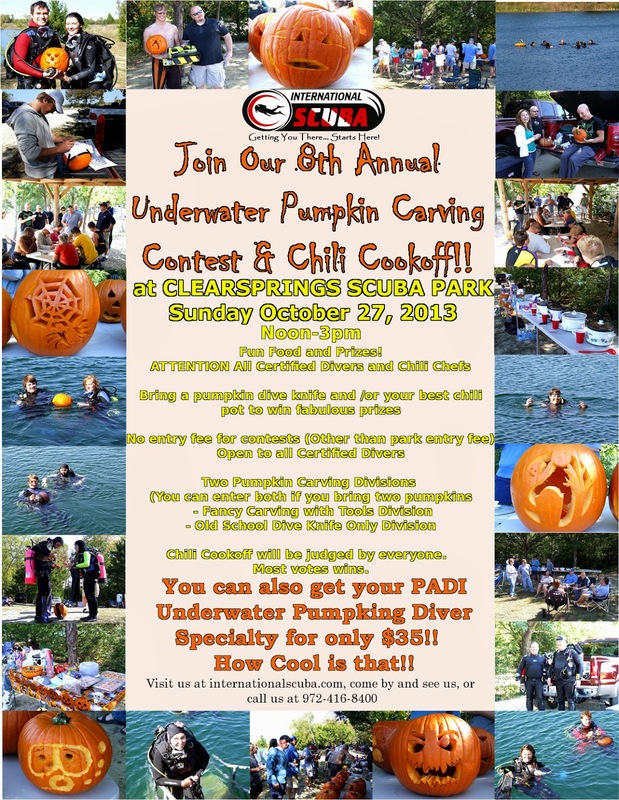 Bring your best chili, and for you divers we will again have both the anything goes category, and dive knife only. Animal encounters are the focus of the expedition. Daily itineraries will be dictated by wildlife opportunities. Numerous kinds of penguins will be sighted during this peak of breeding season. Other wildlife encounters possible are: leopard seals, Humpback whales, Minke whales, Weddell seals, blue-eyed shags, fin whales, Gentoo and Chinstrap penguins and much more. Landscapes including rugged mountains, pristine bays, huge glaciers and icebergs will be a photographer's delight. o Only a limited number of opportunities are available each year to dive Antarctica. Nancy is holding a precious few spaces - act immediately to secure your place! Nancy has reserved the best cabins aboard the 90 meter vessel, hosting a maximum of 110 passengers. Act now to reserve the most comfortable, outside cabins at midship! Cost per person beginning at US$6900. This excursion is for the ultimate traveler seeking the best encounters with nature, wildlife and the most pristine landscape left on this planet. Please contact Nancy for more details. We are hosting the October IDC beginning 2nd - 6th for the Assistant Instructor portion. Evening nights beginning at 5:30 and 8 am start for weekend. The 9th - 14th for the Open Water Scuba Instructor portion with same time schedule. Who's in? taking candidates now!